Louis van Gaal says what Marcus Rashford has achieved in his first week in the Manchester United first team is unbelievable. The gaffer hailed the ‘unbelievable’ impact of Marcus Rashford after the young striker scored twice in Manchester United’s 3-2 win over Arsenal. The 18-year-old only made his debut for the club on Thursday, scoring twice on that occasion too against Midtjylland. Ander Herrera added to Rashford’s two first half goals to ensure goals from Danny Welbeck and Mesut Ozil for Arsenal were in vain. “It’s unbelievable when you are 18 years old and you come in,” Van Gaal told Sky Sports. “I can understand it like last Thursday against Midtjylland because you are coming in and you do your thing without any pressure. Asked in his press where Rashford’s debut ranked, the former Barcelona, Bayern Munich and Ajax boss placed the teenager in an elite group. 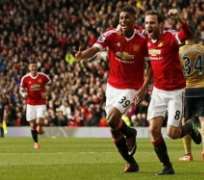 Van Gaal was delighted with the performance of a side missing a number of key players and including several youngsters aside from Rashford. “When you see the circumstances, the many injuries and a lot of youngsters are participating, it was a great match,” he added. “Also for the fans, they were very enthusiastic throughout the game. We scored goals, we are defending our result and we did it much better than the last matches because we didn’t give many chances away. “The second half I changed the shape a little bit because I wanted to defend the result. We were more compact in the second half and you can score also so I’m very happy because it’s an important victory over Arsenal – who in my opinion are one of the best teams in the Premier League. “The key factor is always that you dare to play and we can play very good but we have to move the ball more quickly and we have to switch the game more frequently. The two goals that we scored in the first half were through the switching of the game.